Our goal is to make sure that we’re the only place you ever turn to for roofing services in Orillia, ON. When it comes to the roof that sits on top of your home or business, you might not think too much about it. Fortunately, you have us at Slippery Slope Roofing to think about what’s going on with your property’s roof for you. 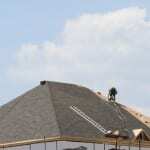 We provide a number of roofing services in the Orillia, Ontario area and are known for the quality of our workmanship. Some of our roofing services include roof repairs, roof replacements, and roof installations. When you call us for help with your property’s roof, we’ll take the time to assess its condition and provide you with reliable recommendations. For example, if a large storm recently blew through your area and you think your roof needs to be repaired, we’ll thoroughly assess the extent of the damage, let you know what needs to be done to fix it, and handle the repairs in a professional, efficient manner. Our goal is to make sure that we’re the only place you ever turn to for roofing services. To make this happen, regardless of whether we come to repair or replace your roof, we’ll be open and honest with you, answer all of your questions, and charge you affordable rates for our services. Our roofing services are backed by over 50 years of combined experience in the roofing industry. To schedule a time for service or to find out more about what our team can do for you, get in touch with us at Slippery Slope Roofing today. At Slippery Slope Roofing, we offer high-quality roofing services in Orillia, Barrie, Bradford, Alliston, Newmarket, Cookstown, Beeton, Innisfil, Angus, Collingwood, Wasaga Beach, Oro-Medonte, Midland, New Tecumseth, Clearview, Bradford, Essa, Stayner, Springwater, and surrounding areas of Ontario.